Possible new dates for this project. These classes and teaching seminars are on hold again. Same problem as before - my work load is still too high and I cannot come up with enough time to conduct these seminars. With a little luck, I will have enough time to start these classes again next spring (2011). Updates will be posted here on this page. For new smiths that interested in participating, please contact the webmaster at the email address at bottom of this page. 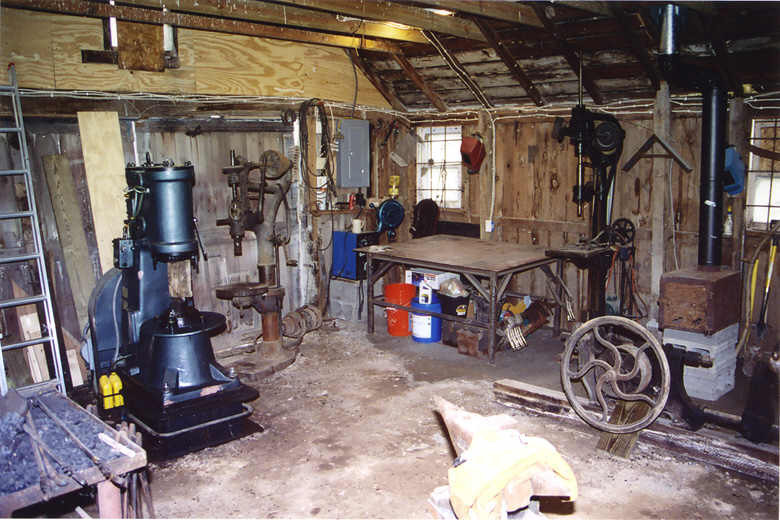 These seminars are for beginners and novice level blacksmiths. Beginners do not need blacksmithing experience to participate in these seminars, and indeed it is preferred that new smiths have not had previous training or experience. This series of teaching events and seminars will be spread out over the fall and winter and spring - until Lilies War of 2011. In preparation for the upcoming 2011 Lilies War, in the Kingdom of Calontir. 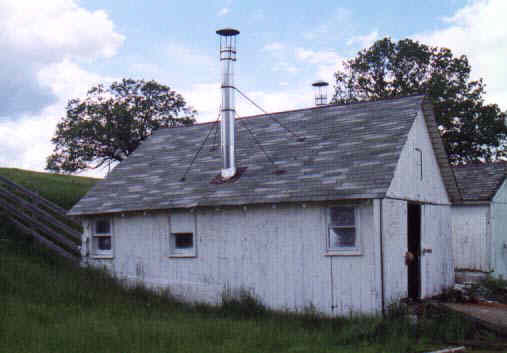 Hands-on instructional workshops and teaching seminars will begin soon, to prepare a small group of new blacksmiths to forge a group project at the Lilies War 2011 - the Capel Garmon firedog. To create the Capel Garmon firedog, the smith must be able to forge weld heavy and light bars, forge animal heads, forge scrolls, punch, slit, rivet, and forge accurately to specified dimensions. The smith must also be able to make all of the tools that are required for this work because the special tooling can not be obtained anywhere else. The teaching seminars planned here will teach all of these skills. To learn more about the Capel Garmon firedog project go here: (new URL) http://www.beautifuliron.com/Lilies_War_Project_2011.htm . This events will be open only to SCA members. Firedog project for Lilies War. PROJECT: To forge a replica of the Capel Garmon Firedog as a group project at the Lilies War. This team project is for beginner level blacksmiths. 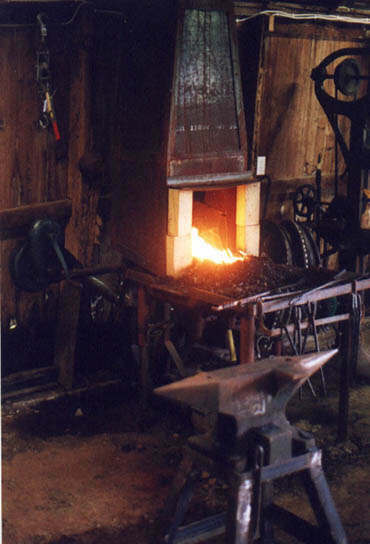 Aspiring new blacksmiths who wish to participate in forging the Capel Garmon Firedog, must first become proficient in all tasks of the medieval blacksmith, and by proficient I mean that new smiths must be able to perform all forging tasks at the journeyman level. During this project, the new smith will learn advanced level blacksmithing skills through a series of classes and training workshops. These are live hands-on training seminars. Forging techniques will be taught in an I-do-you-do format. These new skills will then allow new smiths to make this complex firedog. All students will be required to do their best work. This is a requirement! You will do your very best work here or you will not be taught. This is a rare opportunity to learn the best techniques for only the cost of materials. 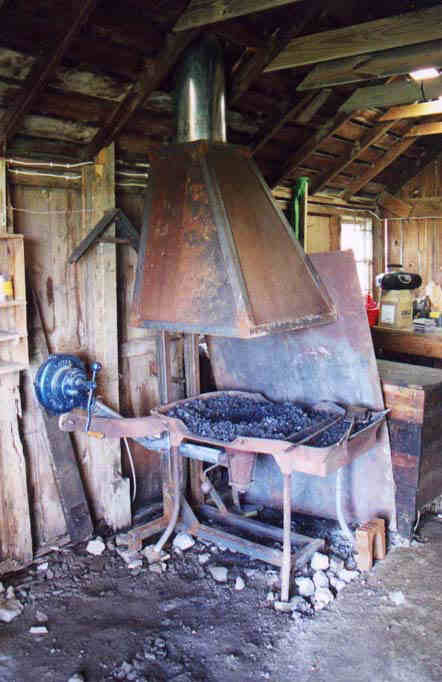 These training seminars are only for new blacksmiths that really want to learn. Class Schedule. To be announced (possibly starting around the end of October of 2010. Training seminars will be hosted in the shop of Hans Schlosser approximately one or two weekends each month until the next Lilies War. New SCA smiths that are interested in participating in this project and attending training should send email to Hans at the email address at bottom of this page. Traditional blacksmithing skills. 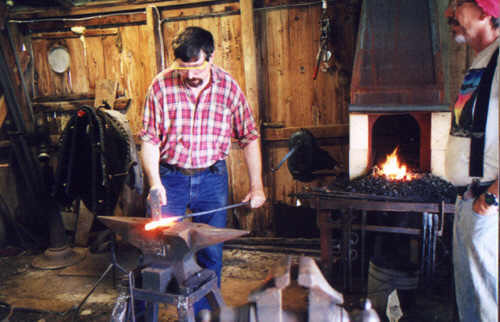 A series of teaching events will offer hands-on classes and workshops to teach beginning blacksmiths the traditional blacksmithing techniques that are used in the production of ornamental ironwork for residential and commercial customers. We will use traditional blacksmith methods to draw, taper, weld, punch, cut, bend, upset, shoulder, fuller, pierce, rivet, and twist. 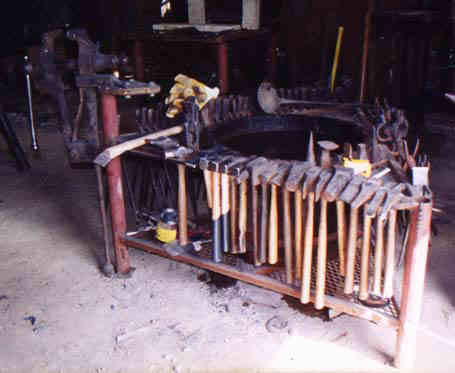 Using the coal forge, anvil, tongs, blacksmiths hammers, vises, punches and chisels and special tooling. No arc-welders, no gas welders, no grinders or sanders, no gas forges, no bondo. 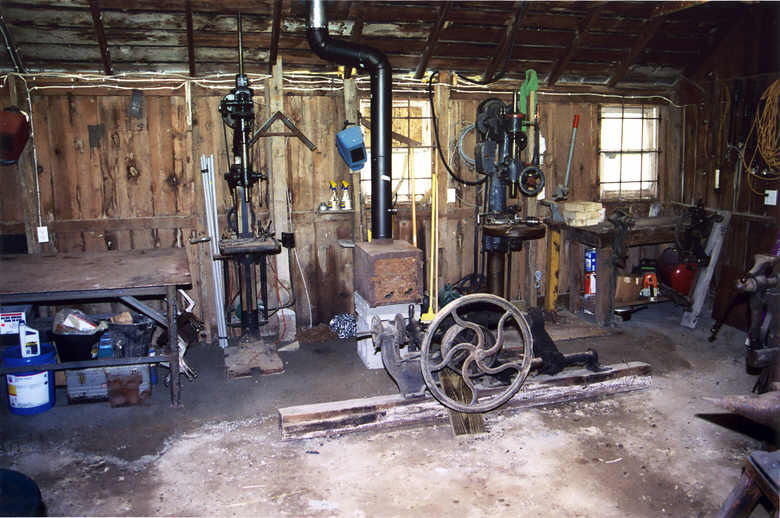 If a smith wants to see how to forge good tools and good ironwork then this is the place to see it - and learn it. Teaching projects will include: small tools and punches, hammers and hammer tools, tongs (light and heavy), carving animal faces and animal heads, scrollwork and forging scroll jigs, building forges and bellows including the pair-of (side by side) bellows and the great (compound) bellows. These are real projects. We will actually be making these things during the forging/teaching seminars. Students will take their finished projects home with them. Many of these same tools, forges, and bellows, will be used during the Lilies War event. At least 3 sets of forges and bellows must be made before the Lilies War event, so that we have enough forging stations for each forging team. 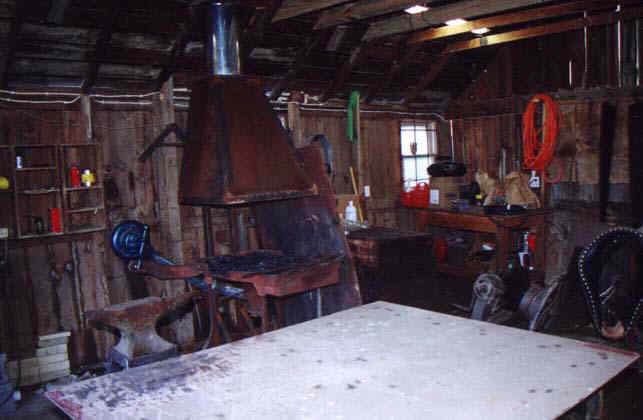 The blacksmith shop is undergoing renovation at this time. The building is approximately 21-feet square with an 8-foot ceiling. There will be two forge hearths set up in this shop after renovation is complete. However, there will be only one anvil available. We will need more anvils. 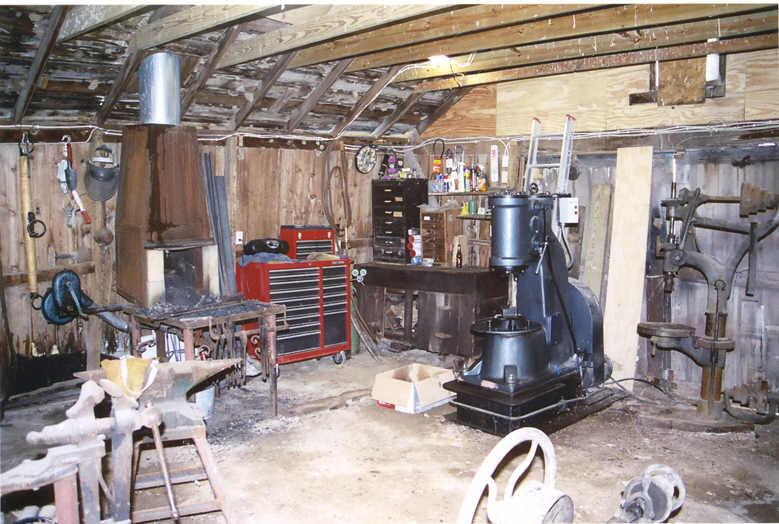 Scroll further down the page to see the most recent photos of the blacksmith shop. Class size is limited. To be announced. 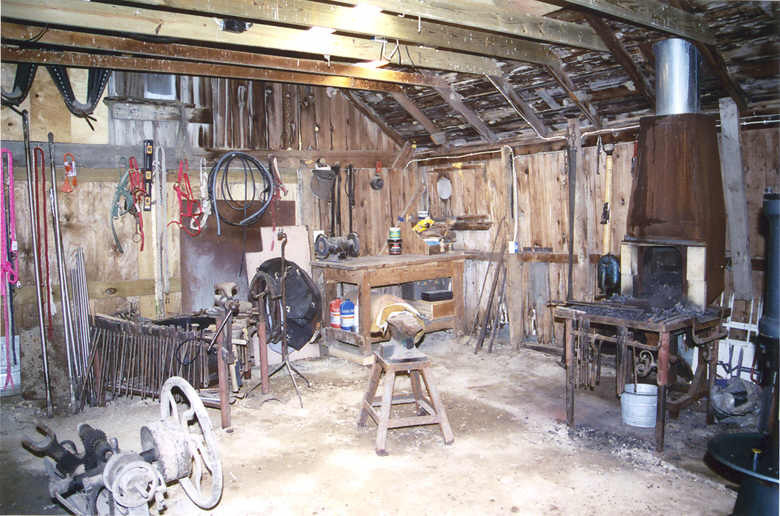 Due to limited number of forges and space, classes will be limited to 4 students, or possibly as many as 6 or 7 blacksmith students at one time (2 per fire and 2 or more students for forge and bellows construction). Safety considerations. Eye protection is required for all smithing classes. We will provide safety glasses for those students who don't have their own. 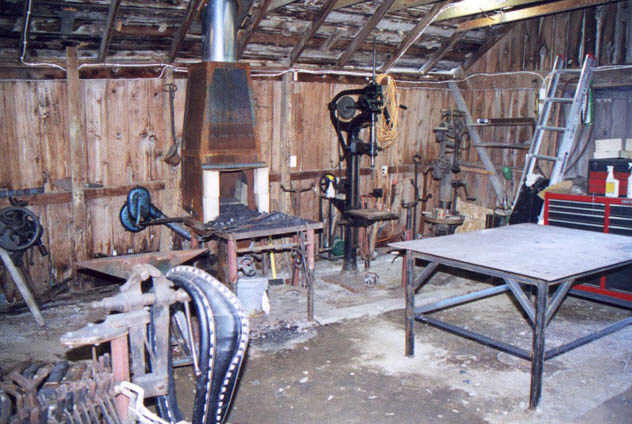 Gloves are not needed and will interfere with much of the blacksmith's work. Anyone using gloves will be allowed to use only loosely fitting welders gloves. Blacksmithing is dirty and dangerous work. You will get burned! That is the nature of this business. Costs. I have not determined costs of materials at this time. Some could become very expensive - such as materials to build the bellows. 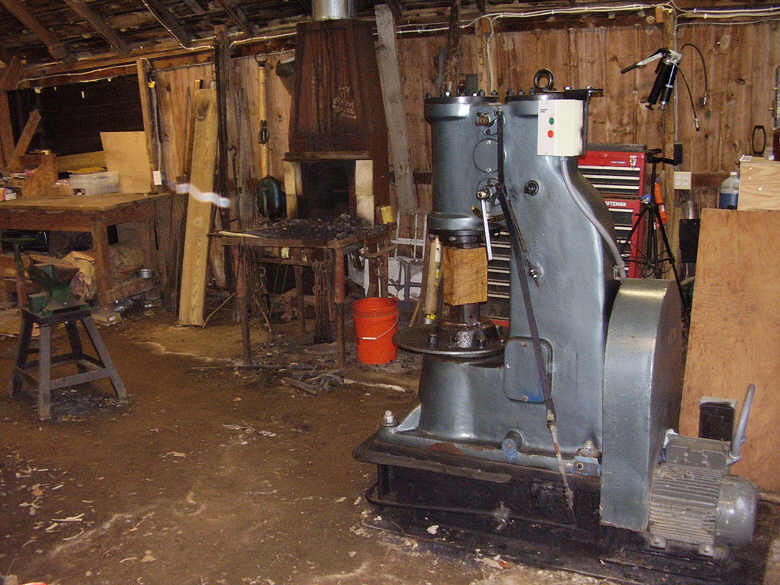 We can save on cost of lumber for the bellows and forges, by purchasing our lumber at a nearby sawmill. But I don't have a good source for the leather. Steel is expensive. Fortunately, we don't need to buy a lot of steel for this project. Coal is going to get much more expensive. I have not purchased coal in a long time, so I am guessing that the cost of a fire will be around $2 per hour. I will have a better idea on costs after some investigation later. August 26, 2008. These photos reflect the most recent equipment arrangement in the shop. New photos will be added soon. Older photos of the shop are at the bottom of this page. Iron rose carving demonstration. October 5th, 2002. At this event, our team of blacksmiths carved a wrought iron rose from a single bar of 1-1/2" round steel, using traditional methods taught to European blacksmiths for centuries. The event was filmed for an amateur video entitled Fire & Roses. Tongs forging classes. The light tongs class has always been very popular and we will continue to offer this class in the future. At left are some of the light tongs from a recent tong making class. Every tong demonstrated one step at a time in front of student smiths - demonstrated in an 'I do, you do' format. The light tongs class is often the first tongs making class for new smiths. The same principles are used later in the heavy tongs classes. Light tongs are much easier work than heavy tongs, so they make for a fast and easy way to learn the overall principles of tongs making. This class is for serious students of blacksmithing only! Materials are inexpensive and total time is under 4 hours for most beginners. Students take their tongs home with them when finished. Gargoyle dagger classes. This is one of the most popular classes we have ever had. We will continue to offer this class in the future. 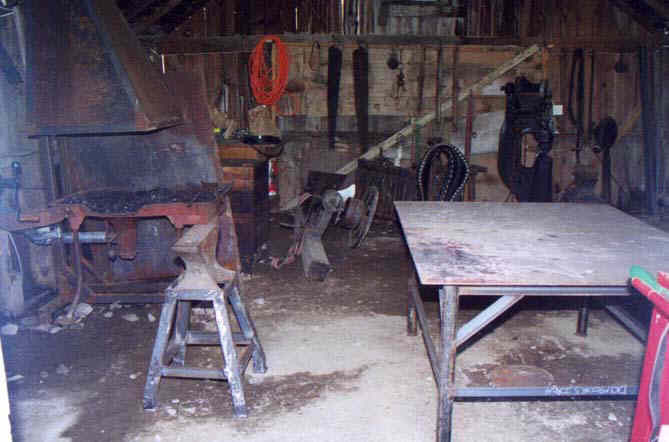 This class is offered to beginners and experienced blacksmiths alike. At left is a dagger from a recent class on forging flat style gargoyles. Future classes will include a larger variety of gargoyle and animal heads based on examples from Swedish medieval ironwork. November 30th, 2005. The floor along the south side of the shop was torn out and replaced with a roughly level surface. 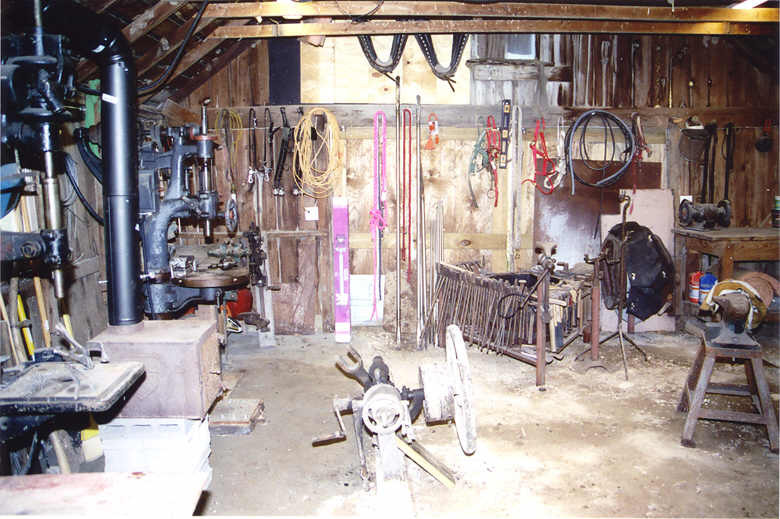 Much of the equipment and horse related gear that once cluttered every available bench top, was moved to another harness room. There is much more space available and some of the trip hazards in the floor have been eliminated by the replacement of the south floor. There is however still some equipment that needed to be removed. 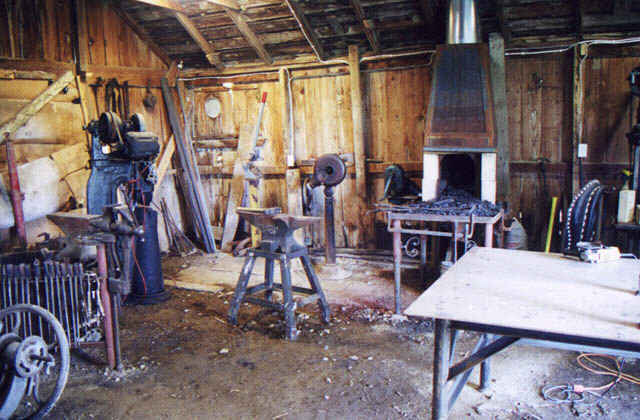 Old photos of the blacksmith shop as it was during October 2005 - shortly before repairing the floor on the south side of the shop. Most of this equipment has been moved or upgraded. The reason that the air hammer is seen so imposing in these photos is because there was little floor space available in the shop at the time. Every available table and bench was covered with tools and horse gear or something and the reduced work space pushed everything and everyone (including the cameraman) closer together. 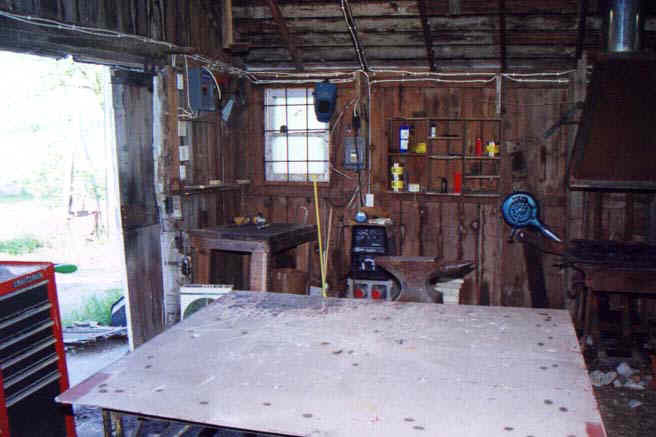 Old shop photos. Date of photos-spring and summer of 2000. Some of this equipment has either been sold, removed, or rearranged. 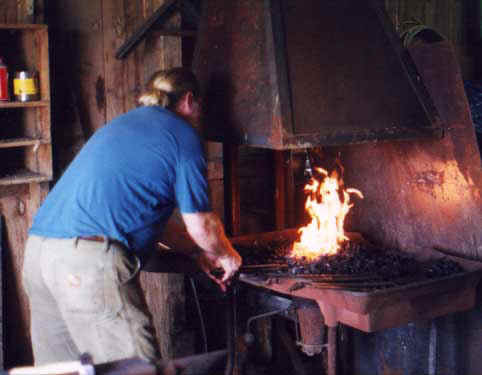 More photos of the steel hoodless forge can be seen at http://www.beautifuliron.com/mysteel.htm and photos of the cast iron forge can be seen at http://www.beautifuliron.com/factory.htm. The goal of these teaching events is to train a pool of SCA blacksmiths with enough foundation skills to be able to participate in large blacksmithing projects at future SCA events. The Society for Creative Anachronism (SCA) is a non-profit organization which studies and recreates medieval life. The shop of Hans Schlosser is located in the Kingdom of Calontir. These classes are not part of SCA. This webpage is part of a private website and is not an official website representing the Society for Creative Anachronism.